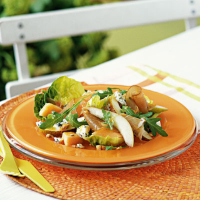 The textures and flavours of this summery Italian salad - smoked ham, sweet pear, crumbly cheese and a nutty dressing - make it a brilliant no-cook starter. Cut the melon into quarters and discard the seeds. Using a small, sharp knife, slice the flesh away from the skin then cut it into bite-sized chunks. Place in a large bowl. Separate the leaves of the lettuce, wash and drain well. Add to the melon, together with the pear pieces and roquette. To make the dressing, place the oil, vinegar and mustard in a small bowl and whisk together with a fork. Stir in the hazelnuts and a little seasoning. Pour half of the dressing over the salad and toss together. Divide the salad between 6 serving plates, top with the cheese and prosciutto, then drizzle with the remaining dressing. To toast your own hazelnuts, cook in a dry frying pan over a high heat for 1-2 minutes, stirring constantly. Use roasted, chopped Marcona almonds or pistachios instead of the hazelnuts, if you prefer.